Another winners are in order for our #TeamSofIshaGiveaway. Our initial plan was to launch all the giveaways simultaneously to celebrate Sofi and Isha's birthday. Pero d kinaya bes, haha! Nakakaoverwhelm ang support ng brands that's why we decided to extend it beyond their birthdays and we will have a random giveaway every now and then to give back to all our readers and supporters of our humble blog. So without further ado, congratulations to the two winners of #BarbieFasionistasXShopgirlJen giveaway! 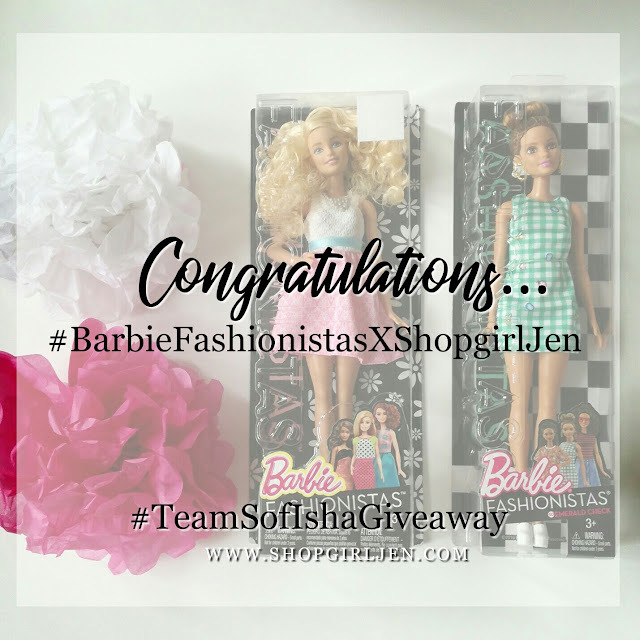 Please email me your Name, Shipping Address and Mobile number at shopgirl_jen@yahoo.com with the subject Barbie Fashionistas Winner. As I've mentioned in my FB post, we're already preparing our next giveaway and hopefully we can launch it this week. Hope you'll all join again. Follow our official hashtag #ShopgirlJenGiveaway and #TeamSofIshaGiveaway for more updates.